An eight-year study of soybeans grown outdoors in a carbon dioxide-rich atmosphere like that expected by 2050 has yielded a new and worrisome finding: Higher atmospheric CO2 concentrations will boost plant growth under ideal growing conditions, but drought – expected to worsen as the climate warms and rainfall patterns change – will outweigh those benefits and cause yield losses much sooner than anticipated. The new discovery, reported in the journal Nature Plants, contradicts a widely accepted hypothesis about how climate change will affect food production, said University of Illinois plant biology professor Andrew Leakey, who led the new research. “If you read the most recent Intergovernmental Panel on Climate Change reports and if you read the scientific literature on the subject for the last 30 years, the concluding statement is nearly always that elevated carbon dioxide will ameliorate drought stress in crops,” Leakey said. Numerous laboratory and field studies have supported this assessment: In many scenarios, elevated carbon dioxide acts as a fertilizer, boosting plant growth. Plants exposed to high CO2 also reduce the size of the pores in their leaves, lessening the exchange of gases with the atmosphere. This helps plants use less water from the soil. Such findings strongly suggested that elevated CO2 would help plants better withstand drought, Leakey said. To make this discovery, Leakey and his colleagues relied on an unusual technology that enables them to simulate future climate conditions in actual farm fields. The Soybean Free Air Concentration Enrichment facility uses high-tech sensors to determine wind speed and direction, and a computer to regulate the release of gases to expose the crop plants to a given set of climate conditions. 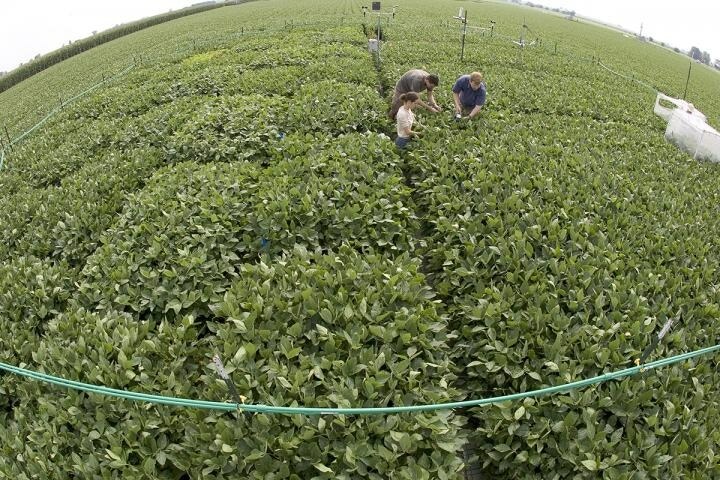 Under hot and dry conditions at elevated CO2, the plants in the SoyFACE experiments used more, not less, water than those grown under current atmospheric conditions, the researchers found. Two other plant responses also contribute to the problem, the researchers found. Elevated CO2 and drought together also influence soybean’s ability to fix nitrogen through nodules formed on its roots. These nodules harbor bacteria that help the plant capture and convert atmospheric nitrogen into a form the plants can metabolize. The new findings, from soybeans grown in one of the most productive regions of the planet, suggest climate-related declines in soybean yields will occur sooner than previously thought, Leakey said. Leakey is an affiliate of the Carl R. Woese Institute for Genomic Biology at Illinois. The U.S. Department of Agriculture’s National Institute of Food and Agriculture, the U.S. Department of Energy and the USDA Agricultural Research Service funded this research, along with a gift from David Sigman to the U. of I. at Urbana-Champaign.